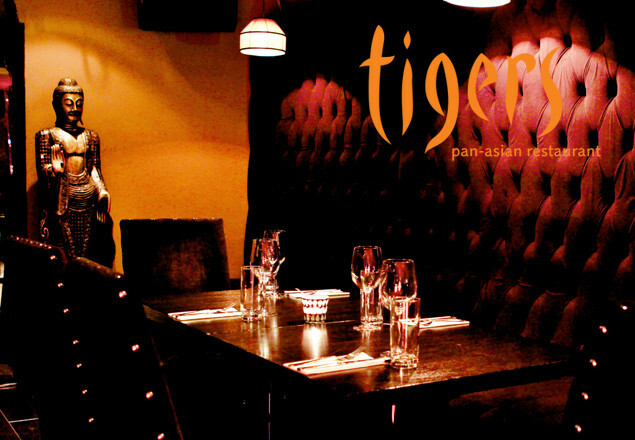 3 course dinner for two with a bottle of wine at Tigers Restaurant, Dawson Street, Dublin 2. Escape to Tigers Restaurant this spring with Rewarding Times and enjoy an authentic Thai experience with a 3 course dinner and bottle of wine for two for €69. Located on bustling Dawson Street, Tigers aims to re-create an authentic taste of Thailand here in the heart of Dublin City. This balance is found through their dedication to using the finest quality ingredients in tandem with each other - locally sourced Irish produce alongside a blend of aromatic herbs and spices imported weekly. Every dish on their menu is prepared fresh to order by the skilled hands of some of Irelands finest wok chefs. Traditional flavours presented in a sleek, contemporary way; this is food that is great for the soul. Maximum of 3 vouchers per booking. Vouchers are valid from April 22nd 2013 until July 31st 2013. Dinner vouchers are valid Tuesday through Saturday from 5pm. Offer includes two starters, two mains, two desserts and a bottle of house wine. Cancellation/re-scheduling of bookings at management discretion.